Anything that consistently draws hummingbirds is acceptable, including a tree or bush. If you are using a plastic feeder and want photos of flying hummingbirds, remove the perches even if you have to cut them off. Remember, flowers don't have perches either. I get the best results from the flat style feeders that can be supported from the bottom. When the support is on the bottom of the feeder, it doesn't get between the camera and the bird. If you are new to this and aren't well versed in studio lighting, use a digital camera. It will make life so much easier than film. As a practical matter, if you want high resolution and high quality images, you will need a digital SLR and a high quality 200, 300 or 400mm lens. A 400mm lens with a minimum focusing distance of 10-12 feet is optimum unless you want to purchase a miniature blind. Because you will have to keep still for long stretches, it's best to be comfortable. I have taken photos while leaning against a building, but prefer a chair. With a digital SLR with a 400mm f/5.6 lens attached, you will need a support to keep the camera in shooting position for long periods of time. This is probably true of any camera. If there are lots of hummingbirds, then you probably won't have to wait long and can probably do without a camera support. I always use a monopod with a small tilt head attached. Unless you are photographing hummingbirds in direct sunlight, you will need a flash. Get a unit dedicated for your camera that has a guide number of 120 or so. The guide number is an indication of how powerful the flash unit is. On-camera flash is not really powerful enough to give you consistently good results without the camera setup that I am recommending. A Better Beamer or other flash extender will usually give you an extra stop or two of flash power. It is extremely helpful when using the "high speed sync" feature of a dedicated hot shoe flash. A flash extender will not work with your camera's built-in flash. Though I haven't really discussed this elsewhere, this is probably the most important consideration to success. You need a combination of things in a location. First, hummingbirds must like it and be willing to feed there. It should afford shade to the feeder (and to the photographer if it is hot out). The background should be either pleasant or far away so that it will be out of focus. It should allow room for the convenient placement of a chair at an appropriate distance. And it should allow for the placement of a flat feeder that can be supported from the bottom. If you are not using off-camera flash, the location should be in the shade of an upright object and have a clear view of the sky. Your feeder should be set up so that it is 4-6 inches below eye-level of your shooting position. The basic idea is that you want your camera to be at the same height as the hummingbirds that you are shooting. If you are sitting in a chair, this will be somewhere in the vicinity of 3-4 feet or so, depending on your height and the height of the chair. Setup and leave this feeder in this position permanently if possible. Let the hummingbirds become used to the feeder in that location even when you aren't photographing them. Take down your other feeders before starting your session. Yes, the hummingbirds will feed at the furthest feeder from you if you leave them up. Set up your chair so that your camera will be about one foot beyond the minimum focusing distance of your lens at its longest focal length. Test this by sitting with your camera, if you have a zoom lens, set it at the maximum magnification and find the location where is will just focus on the feeder, then move back 12 inches or so. An interesting way of accomplishing the set up in a comfortable way is to shoot out the open window of a building. The building will then double as a blind. You can even close the curtains, just leaving enough room for the camera lens to point and flash to shine through. My first hummingbird setup was done this way. However, close the window when you are done with the shoot so no hummingbird flies into your house. 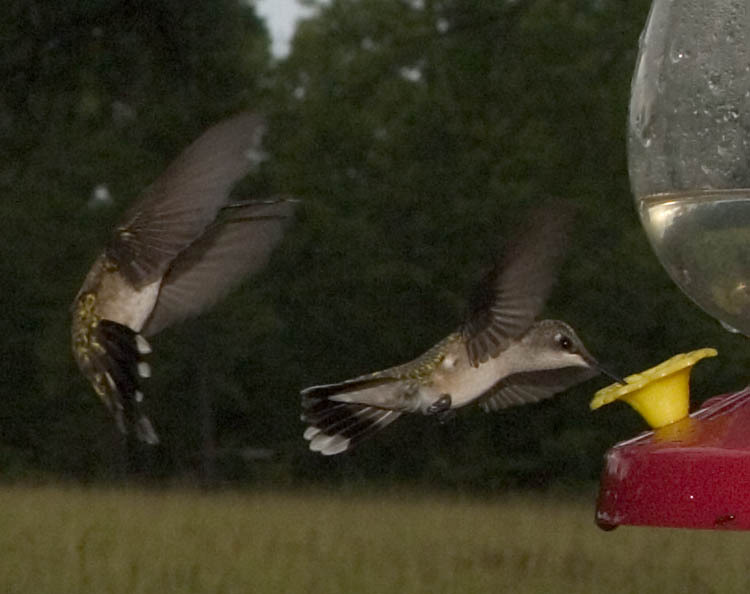 If you are certain of the omnipresence of hummingbirds at your feeder, you can skip this step. Otherwise, don't waste your time sitting motionless in your chair. Get your camera equipment together and keep and eye on the feeder. After you see a hummingbird feeding, chances are it will be back in about 15 minutes or so. So once you see a subject, move on to the next step. If you don't see one, put your other feeders back up and try again tomorrow. Start with these, take a few shots of the feeder and change the ISO or aperture to get the exposure level you want. When using flash, close aperture and/or lower ISO to darken the background and use -1 to -2 stops flash exposure compensation if your camera or flash supports this feature. I grew up learning to hunt at a young age, so this part came easily to me, but it cannot be stressed enough, BE STILL. This is where a monopod or a tripod will come in very handy. The camera needs to be in shooting position. If you wait with the camera in your lap or hanging on a neck strap and then put it to your eye when the hummingbird gets into position, you may have made your wait a waste of time by scaring the hummingbird away with your movement. Sit in your shooting position and be prepared to sit for 30 minutes to an hour. My most productive sessions have lasted two hours or more during which I have taken up to 50 shots during 5-6 separate visits to the feeder with 15 minute waits in between. What you will probably notice first is the hum of the hummingbird's wings. Don't look around for it, keep your eye on the prize, the feeder. That is where the hummingbird is going so be patient. When the hummingbird first approaches the feeder, focus on it, but don't shoot yet. Let the hummingbird sip the nectar first, then when the hummingbird pulls out of the feeder and backs up a little, shoot. It has been my experience that hummingbirds aren't all that skittish, but they will go away if there is a large amount of movement near the feeder or if they are flashed before they get a sip of nectar. Once they know the nectar is there, they are more tolerant of the flash. 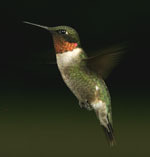 If there are numerous hummingbirds competing for the feeder, your movement and activity is less of a concern. What if you don't have a 400mm lens or a digital SLR? Hummingbirds will tolerate your presence very close to the feeder if you remain still. The following photograph was taken while I was standing within two (2) feet of the feeder trying to use a wide angle lens to get multiple hummingbirds in the photo. The above example is clearly not my best photo. It was taken with a 15-30mm lens and hot shoe flash in dark shade, just before a rain storm. These birds were no more than 20 inches from my camera. I was still and held my camera in position for about 15 minutes with no camera support. So if you want hummingbird photos with a point and shoot digital camera or a fixed lens digital camera, just zoom the lens out all the way, stand real close, be still and snap away. You won't know if you can get a decent shot unless you try.